We have found families that have experienced the loss of a loved one wish to provide a special memorial for them around the upcoming holidays or decorate their place of remembrance in a special way. Because of this, our Flower and Gift Shop offers a variety of unique choices. 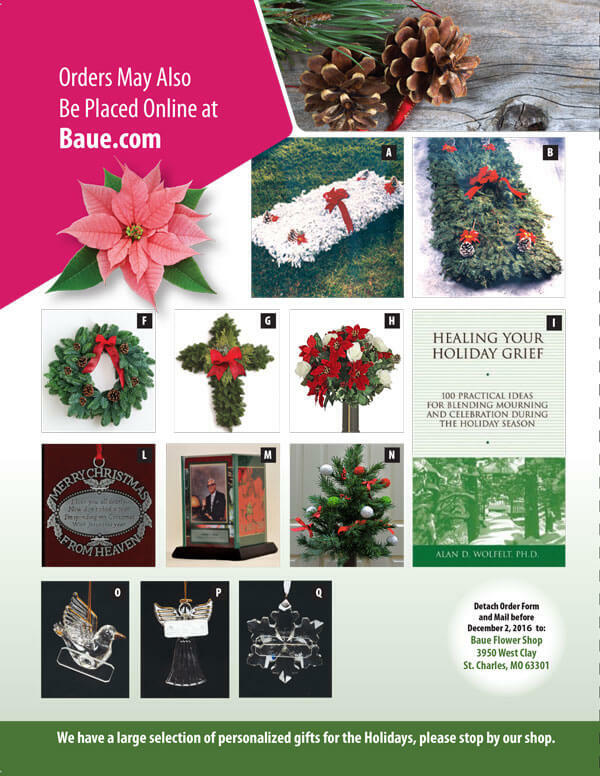 We have a wide variety of holiday silk and natural pine decorations for graves, monuments and mausoleums as well as personalized memorials such as ornaments, candles, angel items and other holiday keepsakes. Click here to view our selection of holiday keepsakes. We invite you to stop in our Gift Shop soon to order them in time for the holidays. It is located inside our Funeral and Memorial Center at 3950 West Clay Street in St. Charles. You may purchase your holiday memorial items at our gift shop, online, or over the phone by calling 636-940-1406. We would also like to invite you to our Annual Holiday Remembrance Program that focuses on how to care for yourself during the holidays. This beautiful candle lighting program remembers your loved one in a special way throughout the holiday season. Click here for dates, times, and other information. You may also register for our complimentary programs by calling 636-328-0874. Our Wish for you and your family is that this Holiday Season is filled with Peace, Hope, and Love.